Karishma will be fortunate to come across good offers, but her choices will hold the key! Transiting Jupiter will be aspecting her Sun and Jupiter in Sagittarius, her Mars in Aquarius, in her Solar Chart, till 11th August, 2016. Saturn will be transiting over her Mercury and Ketu in Scorpio, her Venus in Capricorn, and her Rahu in Taurus, during the entire year ahead. 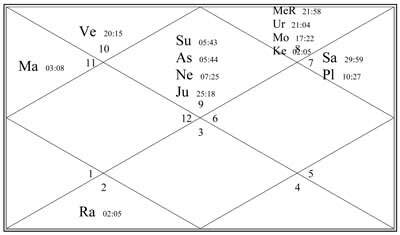 Ketu will be transiting over her Mars, post 30th January, 2016. Karishma will try her level best to give out good performances but the transit of Saturn may restrain her efforts. She may not get due appreciation of the viewers. Though there are a lot of new offers going to come her way, she may not be satisfied with the monetary part and she will be a bit indecisive. She will have to capitalise on the period till 30th January, 2016, as there will be higher chances of her being able to express herself and to come across the better offers. Post this, the transit of Rahu and Ketu in the Leo-Aquarius axis will make things confusing and tricky for her. Ganesha notes that she may feel physically stressed and remain in stressful condition during the year. Romance and matters of the heart will require her attention and proper handling. In a nutshell, she will be lucky enough to come across some bright opportunities and assignments, and will be be able to strike balance gradually. Though things may not look up all of a sudden, with due persistence, hard-work and consistency, she will be able to enjoy a smooth and enjoyable ride ahead. Ganesha wishes a great time ahead to Karishma Tanna.